Get a mobile or smartphone that is flat. An iPhone is good for this. Make a note of the number. You also need a pack of cards. Put the mobile onto vibrate mode. This is pretty important as you will be setting up an 'earthquake' using the vibration. Now place the phone flat in the middle of a table. The challenge is for everyone in turns to build a small house of cards on top of the phone. 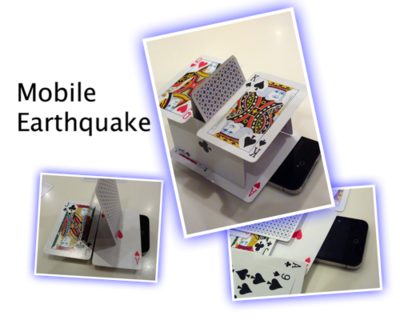 All you need to do is ring up the mobile, and see if the vibration of the call will knock down the card house! It just makes everyone burst out laughing. Take it in turns, and count how many cards each person can build up and survive an 'earthquake'. Don't count any cards that started off lying flat on the phone. Winner goes to the largest surviving card house. If people are struggling to build a card house, lick the touching edges of the first few cards. It helps them to stand up better.